The Bijlmermeer is noisy, thanks in part to planes constantly flying in and out of Amsterdam’s Schiphol Airport nearby. And in the 1970s, many of those planes carried residents from Suriname, a small nation on the northern coast of South America. Suriname, and a handful of islands in the Caribbean, had been Dutch colonies since the 1600s, serving as a lucrative source of revenue from slave labor. 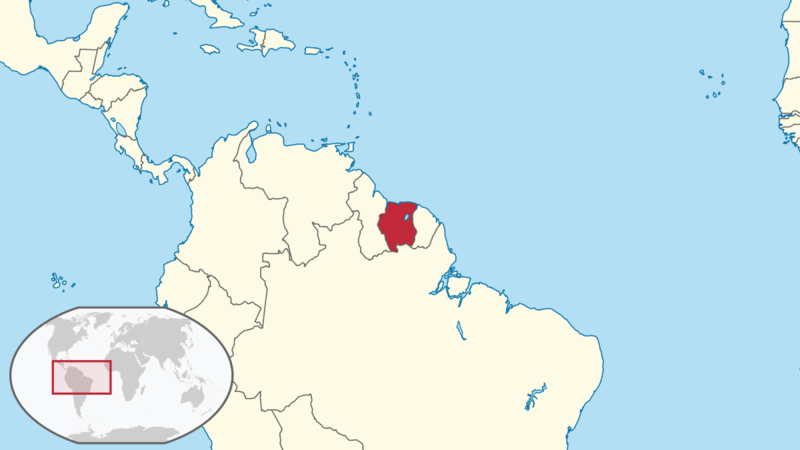 Slavery was abolished in Suriname in 1863, but it wasn’t until the 1950s that its predominantly black population become citizens of the Kingdom of the Netherlands. In the 1950s, people from Suriname and the Dutch Caribbean, gained the right to join their fellow citizens in Europe, an option many chose to exercise in the 1970s. 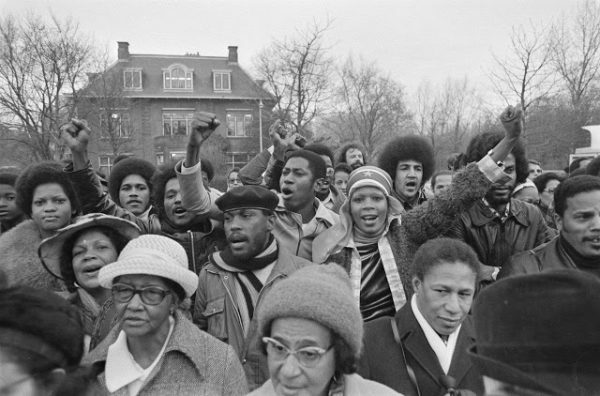 Spurred in part by fears that the Surinamese independence movement would cause a possible loss of citizenship, more than 100,000 people left for the Netherlands in the years surrounding independence in 1975. This large migration was a shock to the government of the Netherlands, which now faced a major housing crisis. With places to live in Amsterdam scarce, the apartment structures of the Bijlmer, with their many vacancies, became an attractive alternative. Ultimately, a lot of the squatters were given legitimate leases, and over time, more and more Dutch Caribbeans moved to the Bijlmer. This was not a welcome change to all of the white Dutch people living in the Bijlmer. 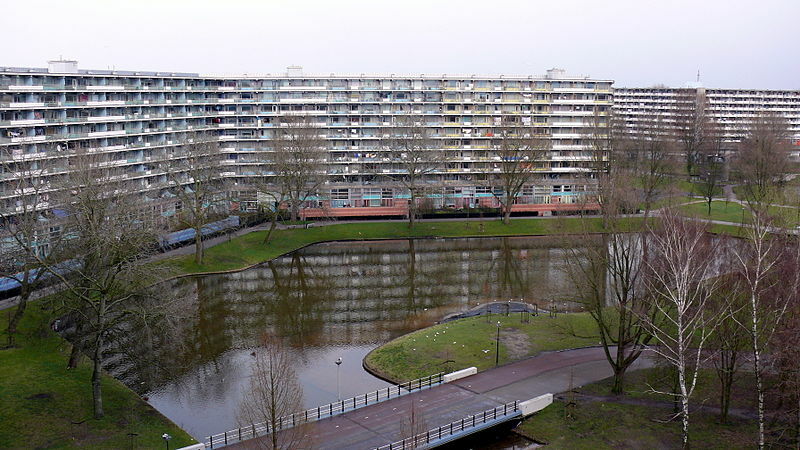 Pi de Bruijn, a Dutch architect who helped design the area (and was living there in the 1970s) called it “an invasion” and “a ghetto.” Guilly Koster admits it took the Surinamese time to adapt to living in the Bijlmer, but disputes the view that it was a ghetto. Koster points out that it was a failed experiment before the newcomers showed up, hence the vacancies. Increasingly, the Bijlmer attracted the people who couldn’t afford housing anywhere else, or were being discriminated against elsewhere. Over time, thousands of gay people moved there, and immigrants from places like Turkey, Morocco and Ghana who came to the Netherlands for work. But the fact that the Bijlmer had become undesirable to people with the means to live elsewhere was really disappointing for the people who designed it — they had thought they were creating a better kind of city, a utopian paradise that people would line up to live in. In the late 1970s some them were still working on the project, including the lead architect Siegfried Nassuth. 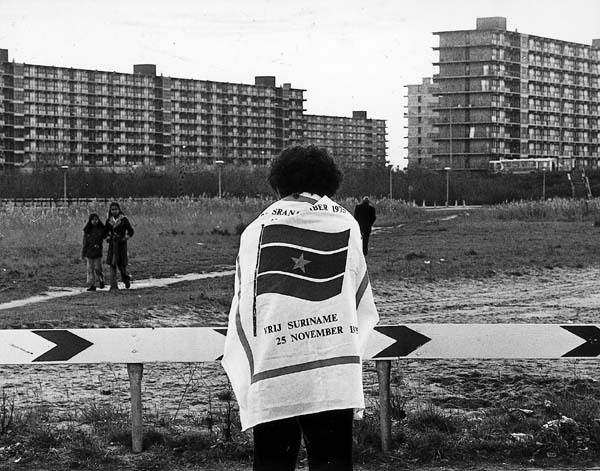 Partly because of his disappointment, in 1979, Nassuth abruptly quit his job at the Bijlmermeer. He walked out of the office, and didn’t even say goodbye. 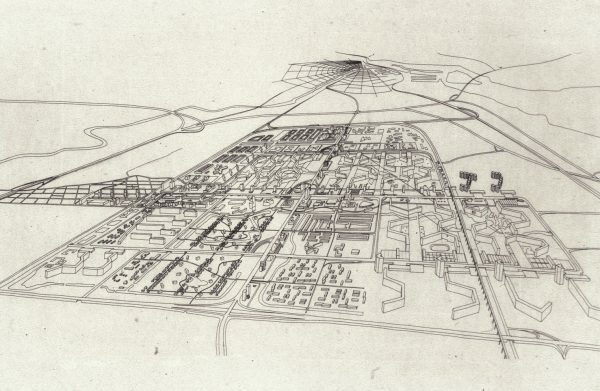 The visionary behind the Bijlmermeer had given up on it, but the story was far from over. 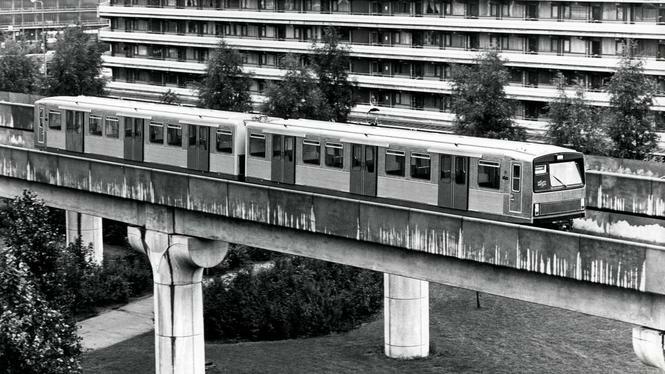 In 1980, the metro train connecting the Bijlmer to the rest of Amsterdam finally arrived, and a shopping center opened up nearby. But the Bijlmer still didn’t fill up. At the highest point of vacancy in the 1980s, 3,200 apartments were sitting empty, about 25% of the units. Eventually the several separate housing associations that managed the Bijlmer merged into one, but because of vacancies and a vulnerable population that couldn’t always make rent, the association was often broke and couldn’t do routine maintenance. Elevators were constantly broken. There was vandalism, and most devastating of all, heroin. Tahirah’s family eventually left the Bijlmer, as did many other families. In 1987, the burglary rate in the Bijlmermeer was two and half times that of Amsterdam and almost ten times the rest of the Netherlands. 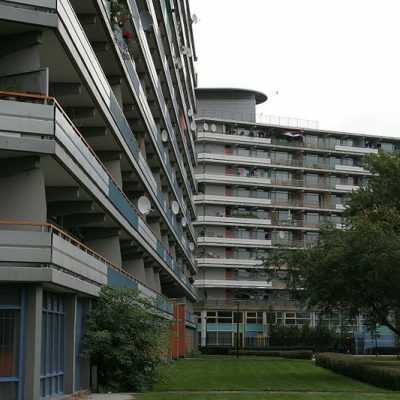 Over half of the Bijlmer residents were victims of crime in 1988. 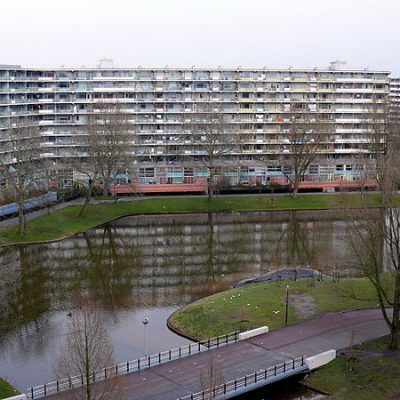 By the 1990s, the Bijlmermeer had come to be known as “The Drain of the Dutch Society.” While various small measures had been attempted to help the Bijlmer — including better maintenance, security cameras and subsidized rents— nothing seemed to work. Finally, the government decided they had to do something drastic, feeling the time had come to demolish some of the buildings. But before they could start, something horrible happened. On October the 4th, 1992 a cargo plane leaving Amsterdam’s Schiphol airport lost power in two of its engines. From an altitude of about 4000 feet, Flight 1862 nose-dived into an apartment building at the Bijlmermeer. The official record says that 43 people died, including the three crew members on the plane. But the actual number was most likely higher since there were many undocumented people in the building. Even before the plane crash, the government had planned to demolish some of the large high-rise apartment buildings. But the crash provided an extra imperative. The whole country was suddenly focused on the Bijlmer and its struggles. Over the next 15 years, the city removed several of the high-rise apartment buildings, one after another as the residents were relocated. The buildings weren’t dynamited, like the infamous housing project, Pruit Igoe, in St. Louis. Instead, they were taken apart story by story to avoid creating the impression of a neighborhood being blown up and forsaken. In truth, they weren’t just going to tear down Bijlmer—they were going to redesign it and make it better. Eventually, many of the high-rises were replaced with smaller buildings, between one and five stories. Shops were relocated to be closer to the housing, and parking garages were torn down because no one was using them. Elevateds road were eliminated, putting cars and drivers back to ground level. Accommodations for bicycles were provided. The goal now was to mix functions instead of separating them. Mixed-use development is now popular all over the world, and it’s the exact opposite approach from the modernist idea of separating functions. Planners have also realized people don’t want their cities to function as well organized machines. Yes, people want their apartments to be quiet and their cities to be safe, but they also enjoy the spontaneity and chaos of traditional cities. Furthermore, planners realized people didn’t want to live in huge concrete structures. Almost immediately after the Bijlmermeer was finished, another neighborhood in Amsterdam was redesigned — it was done with bricks, a traditional Dutch material. 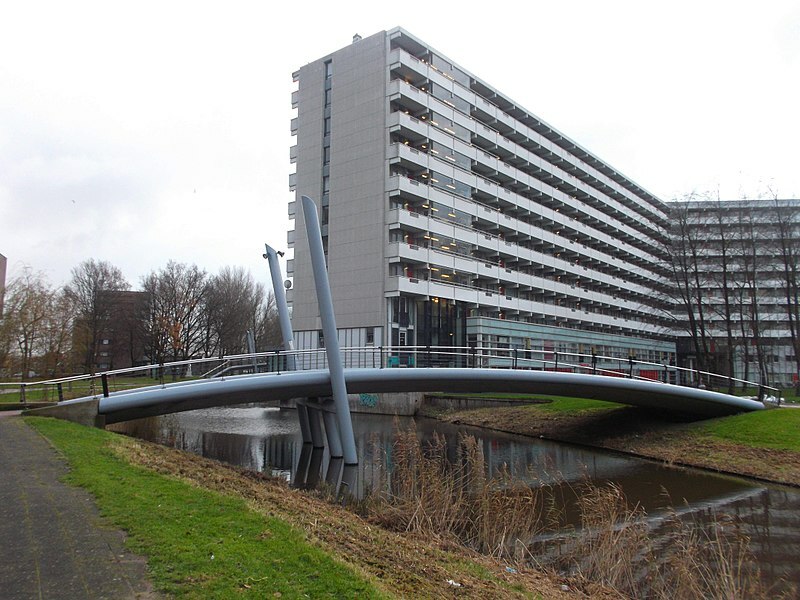 The Bijlmermeer, and maybe a lot of Modernism, was architecture for architects. It was a top-down, paternalistic approach to city planning. The redesign of the Bijlmermeer did not make that mistake. 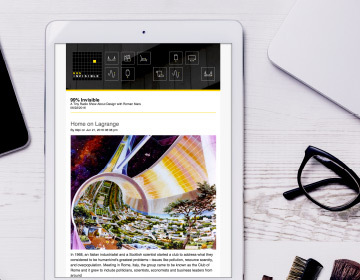 People from the community were heavily involved in the redesign process. And, in addition to changes in the physical environment, job training programs and special housing for heroin addicts were created. Making it financially possible for people to become homeowners has also been a priority of the re-design, and these days there’s a thriving black middle class there. The Bijlmer is one of the most diverse areas in the The Netherlands, with over 100 nationalities represented, including (still) a lot of Surinamese Dutch. Producer Katie Mingle worked with co-reporter Chris Bajema, Dutch radio producer on this two part series. This episode featured, Guilly Koster, originally from Suriname but who moved to the Netherlands in the 1970s and lived in the Bijlmer; Tahirah sabayo, who grew up in the Bijlmer, left, then moved back; Joop de Haan, an urban sociologist who worked on the renewal of the Bijlmer; Zef Hemel, former head of the urban planning department in Amsterdam at teacher at the University of Amsterdam; author, Daan Dekker who wrote a book about the Bijlmer; and Pi de Bruijn, an architect in Amsterdam who worked with Siegfried Nassuth on the design of the Bijlmer and lived in the complex. Special thanks to Frank Wassenberg whose PhD research on large housing estates was invaluable to this series. Coda on the DIY housing movement with Kurt Kohlstedt. Thanks for this interesting podcast (series)! As a Dutch person its very interesting to hear this story from an outsider, and to hear the full history of the Bijlmer and the thoughts of the architects. The idea of purchasing an apartment completely empty and to build its inside to your specific need it’s a cool idea. I used to play with it while I was an architecture student. Now I’m an old guy and the idea of living in a place where ALWAYS will there be SOMEONE doing building work in his/her flat gives me the creeps- The dreams of today’s architects are also full of not well thought through ideas. The podcast presented the project essentially as an architectural failure. However, it didn’t really point out any particular architectural and design aspects that failed. 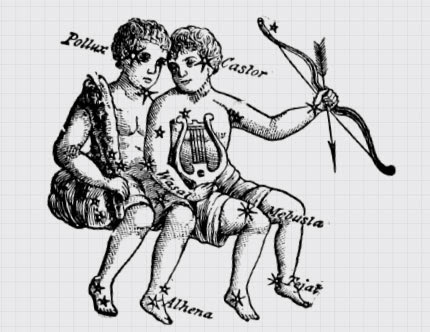 Almost all negative aspects mentioned were not as such the design issues, but rather problems related to the kind of people who populated the development, their level of income and particularities of their culture and behaviour. As I pointed out in my comment to the first part, there were and are examples of successful modernist city design in the former Soviet Union, which are not even mentioned in the podcasts and probably completely overlooked by the authors. I attribute their success to a fundamentally different and evidently superior, judging by the outcome, social and cultural inviroment. Yeah, right. If having no say in deciding where and how you’re going to live is ‘superior’, then I’d rather stick to this ohsodeprived west. The “freewill” of an individual is important of course, but if it forces you to live at a place like Biljimer, I’d rather chose streets without drags, prostitution and crime in USSR. Having lived in the Bijlmer for the past ten years, I am wholly optimistic about the future but a few interventions still need to take place. The Bijlmer needs to escape the stigma of being labeled the first Dutch ghetto. This stigmatization relies of historical amnesia (the first Dutch ghetto being the Jewish quarter during the Second World War) and a general ignorance surrounding the slavery past and decolonization. Upon entry, the Afro- Surinamese that came to the Netherlands in 1974-75 had, on average, the highest level of education and most financial capital of incoming migrants from the former colony. Their rejection by native Dutch, who saw them as an invading army, coupled with a global financial crisis, led to high levels of unemployment and downward social mobility. In recent years, the city has embraced a neoliberal approach to urban restructuring. This has defined the direction of subsidies which are largely tilted towards the creation of a corporate business park, a football stadium and large scale entertainment venues. 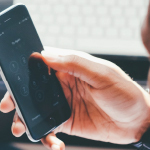 While this has undoubtedly created a boon for the area, those who work in the corporate sector of the Bijlmer have minimal contact with those who live in the Bijlmer, except through the service industry positions in the shopping area. This has created, in practice, two Bijlmers that remain structurally intertwined as the constant influx of subsidy is reliant on the poor socio-economic position of its residents and the use of subsidy is integral to the expansion of corporate Bijlmer. This has to change before the Bijlmer can really rise to meet its full potential. It was quite shocking to learn that the default mode of selling a new flat in my country (barebones, called ‘developer’s state) is so unusual and even considered somewhat innovative elsewhere. I had no idea. You really cannot finish your own flat exactly the way you want? Really? You mentioned Pruitt-Igoe, the similarity being that it was also a large development of apartments, that didnt live up to expectations and was demolished. Tragically there is another related similarity, the architect of Pruitt-Igoe also had not one but two planes crash into buildings he had designed, the WTC. This was a wonderful story, and very well told. That being said, it is easy to scoff at and chuckle about the paternalistic behavior of the architects who conceived this type of new city. And there were certainly mistakes in their thinking. But nine times out of ten when these ideas were implemented the failure was not that of the architects, but that of the planners and city government who failed to fully implement the concepts. It is not reasonable to assume that buildings alone will assist an impoverished community is reaching the middle class. Without transit and commercial infrastructure at the time of residential launch these projects will always fail. Without the possibility of ownership these projects will always fail. And while we now scoff at the idea of separation of commerce, industry, and habitation, the architects were dealing with a level of pollution around the first two that we can’t conceive in this day and age. The idea seems quaint now, but was a truly logical band-aid solution to the realities of the post war world. A wonderful example of the success versus failure of this concept can be seen in San Francisco, where identical towers in the Portola neighborhood and along the Geary Expressway redevelopment have had dramatically different outcomes. In Portola the housing was institutionalized and offered nothing but a cube for living, on Geary at Laguna the very same building has become a coveted property. Portola, on the other hand, was demolished fifteen years ago due to all the problems encountered in the Bijlmer. The difference isn’t the architecture, it is completely in the opportunity of the inhabitants. SPIEGEL: Some people say that if architects had to live in their own buildings, cities would be more attractive today. Koolhaas: Oh, come on now, that’s really trivial. SPIEGEL: Where do you live? Koolhaas: That’s unimportant. It’s less a question of architecture than of finances. SPIEGEL: You’re avoiding the question. Where do you live? Koolhaas: OK, I live in a Victorian apartment building in London. Der, not See. That’s a strange auto-correct. What a remarkable story of transformation! My compliments for these podcasts and the research you’ve done on the subject. 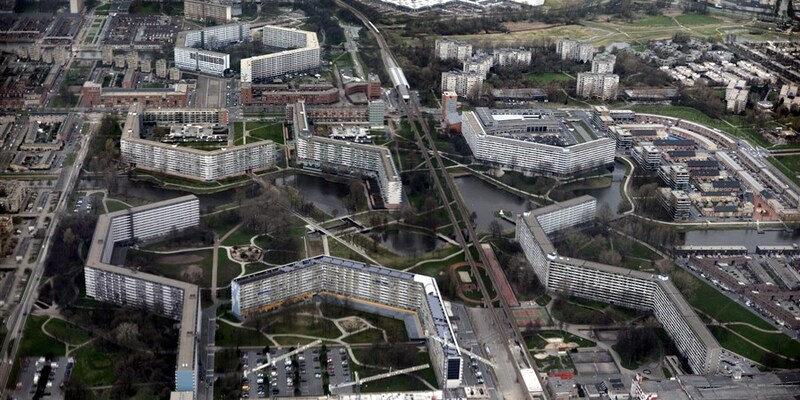 I read about these in one of the main Dutch newspapers, it’s somehow flattering that an urban housing project (on a huge scale, yes) in our small country inspires architecture enthousiasts as far away as San Francisco. I agree with Amy Abdou’s view about the ‘two Bijlmers’ that exist side by side nowadays. Considering Dutch real estate prizes, booming for over a decade now, it is no surprise. I personally know people in the ‘upper middle class’ incomes that have moved out of the old city into the Bijlmer. Simultaneously there is still a large amount of subsidised social housing, nowadays considered a remnant of former politics. I myself live in such a project in Central Amsterdam, though my income is considered welfare level or below, a typical Dutch situation. I watched the excellent documentary about Pruitt-Igoe, searching for similarities with the decline of the Bijlmer. As far as I can tell, the main reason for rapid decline, is in both cases lack of funding for maintenance. 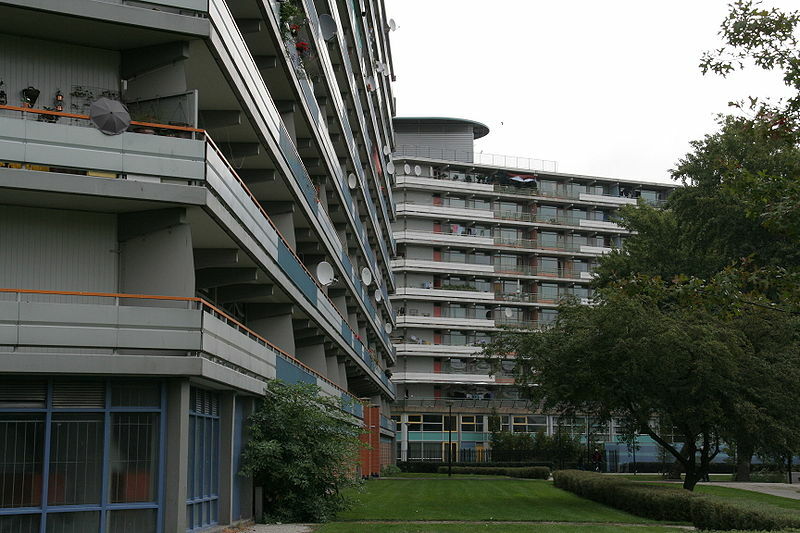 In the Bijlmer, this happened because of initial high rents and a middle class that did not immediately show up, so flats were let for prizes far below the initial rents to poorer newcomers from the Caribbean. Differences between Pruitt Igoe, located in the ‘old’ city and the Bijlmer, a suburban ‘newtown’, were turning out in favor for the latter. Nowadays the mix of social housing and owner-occupied homes proves to be successful. I’ve lived in the Netherlands for over 10 years now and for the last two have worked in an office in Bijlmer – I see that train station looking out of my office window. 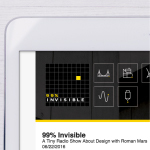 I found these two podcasts really fascinating. The multiculturalism of this neighbourhood and its really creative architecture is one of its draws for me. Enjoying Surinaamse food for lunch once or twice a week is especially nice. Note that I live in Leiden, a nice-sized university town and rather less diverse. I probably would have found this area more than a little annoying had I had to travel by bus every day before the metro came in. Thanks for the great research. I’m a very recent listener of your podcast and decided to give these episodes a listen because I lived in Amsterdam many years ago on a 1 semester exchange program during University. I was having a nice time listenning to the 1st episode of the series when I decided to google the exact location of the Biljmer and found out that I actually LIVED there! We just called Zuidoost and I had never heard of the stories of its past but I guess I was staying in 1 of the rebuilt appartments. Indeed it was less safe than central amsterdam while I was there (2011) and whenever I mentioned where I lived to Dutch people, they would be very chocked and say it was the getto and very unsafe. Although I do know a couple of ppl who got their homes broken into, I didn’t have any incidents while living there and never really felt unsafe, even walking home alone from the subway at night. Thanks for the summary on the Bijlmer history. What was missing in the podcast though, was a critical perspective on the sale/resale of these buildings. I suppose they were public property. Which means the new condo owners payed twice because with their taxes the initial construction was financed. Also, those condos very likely will become subjects of speculation. Which means that the city of Amsterdam started a major gentrification process in this area by selling the buildings. I wonder how the Dutch public feels about this.